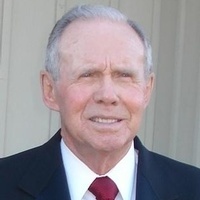 Don Franklin Phillips, age 86 of Dalton, Georgia, departed this life Friday evening at Wood Dale Health Care Center in Dalton, Georgia. Mr. Phillips was born in Blairsville, Ga., Aug. 14, 1931 a son of the late Robert Franklin “Bob” and Bonnie Alexander Phillips. Along with his parents he was also preceded in death by a brother, Jack Phillips. He was a proud veteran of the United States Navy, a member of the South Dalton Baptist Church, where he served as a trustee, member of the mission board and an usher. He was a member of the Alegheny #114 Masonic Lodge in Blairsville. He was also a member of the VFW and the American Legion. Mr. Phillips was a self-made man, he was the former owner of the Phillips Chevrolet in Blairsville, The Phillips Land Company and Eastside Carpet in Dalton. He is survived by his loving wife, Betty Putnam Phillips of the residence; sons and daughters-in-law, Donny F. Phillips Jr. and his wife Sandra of Suwanee, Ga., Ivan and Leah Phillips of Cartersville, Ga.; step-sons and spouses, Alan Franks of Gainesville, Ga., Terry and Judy Putnam of Dalton; grandchildren, Blakely, Hunter, Lauren, William and Isaac Phillips, Seantee Wilson, Tessy Franks, and Josh Putnam; brothers and sisters-in-law, Pat and Susie Phillips of Blairsville, Ga., Troy and Jean Phillips of Dalton; and several other nieces, nephews, extended family members and friends also survive. The family will receive friends on Sunday, April 22, at The Melrose Chapel of Ponders Funeral Home from 4-7 p.m.
Mr. Phillips will then be taken to Mountain View Funeral Home in Blairsville, Ga., where the family will receive friends on Monday from 11 a.m. until the funeral hour of 2 p.m. The service to celebrate the life of Don Phillips will be held on Monday, April 23, at 2 p.m. from the Mountain View Funeral Home with Reverend Billy Stiles officiating. He will be laid to rest at the Old Brasstown Baptist Church Cemetery in Young, Harris, Georgia with Robbie Phillips, Drew Phillips, Greg Hopkins, Josh Putnam, Woody Mullins, and Philip Stubblefield honored to serve as pallbearers. Military graveside honors will be provided to commemorate Mr. Phillips service to our country.